Guess what? It's Monday. Guess what else? Thanksgiving is only a few days away, if you're reading this within a few days of me writing this. If not, I apologize for reminding you about how much longer you have to wait before one of my favorite holidays. I'd like to talk about two things: Getting to Know Your Market and Getting to Know Your Genre. Unfortunately, that second one will have to be saved for next Monday. So, your market. 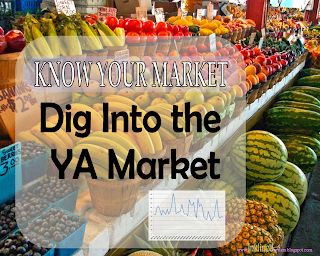 We'll be talking about the YA or young adult market. This market is for books geared to kids ages 12 to 18. I would say it's really more for 14-18 (high school students) but some would argue. If you want to publish in the young adult market, you need to pay attention to it. I have a few tips for you. In my library, I know almost all the children's librarians by their first name. I love this! Not only do I know I'll have at least a half dozen people reading my first book when I get published, but I get the scoop on all the good books of the season. In my library, the YA section is separate from the JV section, but the YA librarian has her office in with the rest of the JV librarians. We talk about new releases, good authors, and the latest book news. It's wonderful. If your librarian has some books she recommends, at least go read up on them. If they look good, check them out, or better yet, buy them! I'm just starting to learn the ropes of twitter. It keeps surprising me when publishers have twitter accounts, but they do, so go follow them. Now would be better. Here's a list of some YA publishers twitter accounts. Epic reads is an online book community for YA readers. It is owned (so far as I can tell) by HarperCollins, but that doesn't mean it just promotes those books. It's a general hub for all things YA books. The website is here, I would also suggest following Epic Reads on Twitter, and tuning in to their weekly Tea Time, which is about a 45 minutes live broadcast where two bookworms on the EpicReads team talk about the books they're reading, give away books, and generally help you stay on top of the YA books that are selling well, (or that HaperCollins wants to sell well.) I've only been following EpicReads for a few weeks, and I've found it very useful. Sidenote: TeaTime was the number 2 twitter trend on Wednesday, when their live broadcast is. Have you heard of the New York Times Bestseller List? While it's not exactly an accurate representation of the books selling the best in America, it is still a great list. Go to the Young Adult List, here. Bookmark it. Check it every Monday morning. If you write for people more of in a 10-14 age rage, also bookmark this. If there's a book on the list and it's been on the list for more than 10 weeks, read it. As I'm writing this, The Fault in our Stars, The Book Thief, and Looking for Alaska have been on the list for almost a year. That means you should read them. They are what's selling in YA right now. They're getting attention. Also check out the USA Today's Bestseller List. You can select the "Youth - Older" genre to get an idea of what YA books are on that list. Once again, if the book has been on the list more than 10 weeks, read it. Or at least Google it and read the back cover blurb so that you know what genre it is (because no matter what USA Today says, 'Youth - Older' is not a genre) and have a general idea of the book. Other good lists can be found on Goodreads. A list of upcoming YA titles or 2014 might have 600 titles, but they're arranged in order of popularity. If you haven't read the first book in the series of the top 5 most anticipated books of 2014, you might want to think about that. The most comprehensive list so far for 2014 can be viewed if you click here. , but you should at least know what genre they are and have a general idea of what's going on in them. In my opinion, this is a great start to having a good handle on the YA market. The bad news is, there's always another book for you to read, but that's the good news, too! What do you do to make sure you know what's going on in the YA market? I'd love to know! Hopefully I'll see you next Monday with a post on getting to know your genre. P.S. I wrote almost 5K for NaNoWriMo yesterday. I've never written that much in one day before. I also broke 40K. Only 10K left to go. We can so do this! I have read the Book Thief and have heard of many of these books or series. 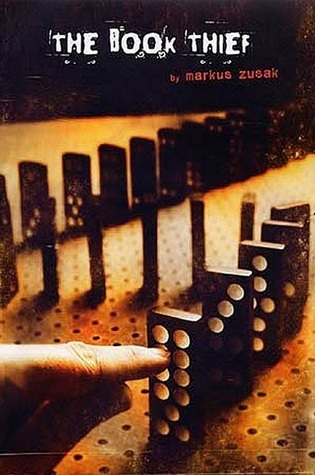 The Book Thief was REALLY good, well-written, felt a little like To Kill a Mockingbird. But it was sad too. I'm glad that some well-written books are actually in the best-selling lists. But I haven't kept up with every detail of what's "currently in." There are hundreds of classics I have yet to read after all, and figure out why they were classics. Also, a lot of best-sellers don't have much of a point to them except to entertain, and I really don't want to write like that. One thing that both alarms me and makes me hopeful at the same time is how much people are excited about the next book or movie. It's alarming because they're just entertainment... almost like idols... but at the same time I'm thinking, "Wow, if they like that, they'll REALLY like my book." But thanks for all these resources! This is cool. I think that there is a difference between entertainment and idols. Something only becomes an idol when you place it above God. I, personally, don't think there's anything wrong with a good story who's point is to entertain. Also, if you look at what's currently selling really well, a lot of the books are thoughtful books, not adventure stories or thrillers. OK, I'm going to sound like a complete rookie but I'm going to ask anyway: whats is YA and JV? I see it all the time but I don't know what it is. Good post. It's okay. We've all been rookies at one point! It's better to ask then to not find out. YA stands for young adult books, which are typically books for kids ages 12-18. While 12-18 is the general age range, I think it more often is geared for teens 14-18. JV stands for juvenile, which means children. JV chapter books are geared at more or an 8-12 year old age group. There is a newer area, too. MG stands for middle grade and is geared to kids ages 10 or 11 through age 14. It helps me to think of it this way. JV=elementary school. MG=middle school or junior high. YA=high school. Thanks for reading. Does that help? Yes! Thank you for clearing that up for me! Excellent post! I'll be sure to check those out.